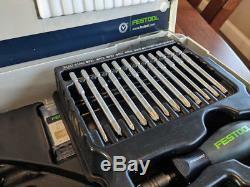 For sale is a Festool Centrotec 98-piece Installers Kit 497628. The kit is gently used with the majority of items not in it not even being used before. The kit is in great condition although the drill set container as you can see from pictures has some cosmetic damage. When I was working I accidentally set a rag down with a little goo gone on the closed container and then when i went to clean it off it caused the smearing / cosmetic marks you see on top of the container. It didn't cause any damage to any of the bits as the case was closed and as you can see the bits are like new as I think I only used one of the bits one time to drill two holes. 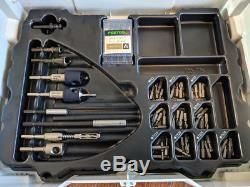 Besides the little cosmetic issue to the drill bits case this kit is like new with very little use. If you have any questions please ask. CENTROTEC magnetic bit fastener BH 60 CE. 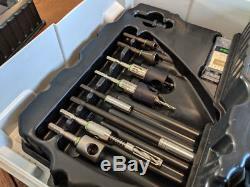 Extra-long CENTROTEC magnetic bit holder BV 150 CE. Deburring countersink QLS D2-8 CE. Deburring countersink QLS D5-15 CE. BTA HW D5 CE drill bit with depth stop. 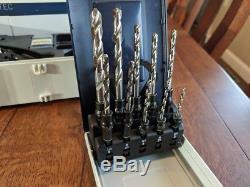 Drill countersink with depth stop, BSTA HS D3.5 CE. Centering bit ZB HS D5 EURO CE. Hook driver HD D18 CE. TwinBOX BB-MIX range of bits. Drill bit case HSS D3-10 CE/10. Drill bit case BKS D3-8 CE/W-K. 12x long CENTROTEC bits PZ/PH/TX. Bit assortment 25 mm, 50 pieces. In SYSTAINER SYS 1 T-LOC. 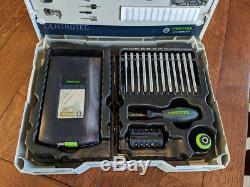 The item "Festool Centrotec 98-piece Installers Kit SYS 1 CE-SORT Assembly kit 497628" is in sale since Tuesday, June 12, 2018. 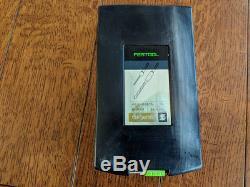 This item is in the category "Home & Garden\Tools & Workshop Equipment\Power Tools\Drill Bits". The seller is "grizzable" and is located in Brunswick, Ohio.